We are used to understanding infrastructures in terms of their functionality, that is, as means at the service of something else or as supports for an activity. However, as this text demonstrates, they are more versatile than what they seem: they can also create new meanings and trigger visions that can even contradict those that originated them. 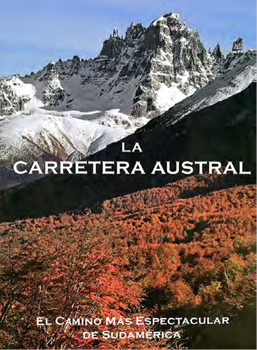 Cerro Castillo, snow-capped and framed by the reddish leaves of a deciduous forest (Figure 1) features on the cover of La Carretera Austral. El camino más espectacular de Sudamérica (Carretera Austral, the most spectacular road in South America) (AA.VV., 2012). The coffee-table book was sponsored by environmental movements that, led by figures such as Douglas Tompkins, have established the idea of ​​Aysén and central-western Patagonia as an immense, virgin reserve to be preserved. The photo integrates a series of publications that these same actors included in Patagonia chilena ¡Sin represas! (Chilean Patagonia, Without dams!) 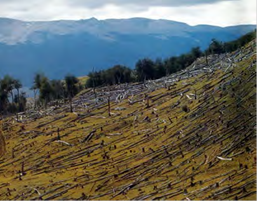 (AA.VV., 2007), a powerful media operation against the hydroelectric generation project HidroAysén. They attempted instead to integrate into the system of national parks several areas that Tompkins himself had acquired since the beginning of 1990s for their ‘rewilding,’ returning livestock areas to their original virgin state and transforming the stretches of roads that traversed them into scenic routes. Figure 1 Cerro Castillo on the cover of the book La Carretera Austral. El camino más espectacular de Sudamérica. In this context, the sublime image of Cerro Castillo - part of those beauties that can be admired from the road - expressed ​​a broader territorial idea: it anticipated the recent constitution of the Patagonia Parks network that, connected by a highway and a naval route, was institutionalized by President Michelle Bachelet in January 2018. The succession of parks (Figure 2) was created to a large extent by integrating Tompkins’s reserves into the system of areas protected by the State. Thus, the project crystallizes an image built through the struggle of environmental groups and the alignment of center-left governments that followed the dictatorship. Figure 2 Parques Nacionales y Reservas Forestales en la Patagonia de Argentina y Chile, 1978. The network consolidates the idea of ​​Patagonia as a territory to be valued because of a hypothetical wilderness and thus be kept aside from development processes. Such idea, as image of a supposed beauty, was intentionally disseminated through a discourse revolving around the possibility of enjoying, by land, of “the most spectacular road in South America” ​​and by sea, of the “scenic route of the most impressive glaciers in Chile, and (...) the world.”6 The discourse stated that, if HidroAysén’s energy route would split the country in two, as a support for scenic perception and ecological continuity this same route would have the capacity to connect it. Featured on the cover of a much older publication, looking up, his arms crossed and with a confident pose, General Pinochet stands in a light blue suit and tie on an extraordinary issue of the Association for Latin American Integration’s magazine in 1981 (Figure 3). The cover celebrated the soon to be inaugurated first section of that same road today applauded by the most radical ecologists, although by entirely opposite reasons. Figure 3 Cover of the Association for Latin American Integration’s magazine, 1981 Extraordinary Issue. As the highlight among a series of propaganda operations, the inauguration of the “Carretera Longitudinal Austral Presidente Pinochet” (President Pinochet Longitudinal Southern Road) conveyed a different message: it was not a route built for visual enjoyment (although beauty was not despised), but an infrastructural work of strategic importance, whose productive and transforming effects on the territory would directly benefit the region’s settlers and the country as a whole. The cover evoked the country’s union through a discourse that, structured around the need for its productive homogenization, conceived the bucolic and depopulated southern territory as an evil to be reversed through settlements and an adequate road system. Associating the project with the face of a character trained in the Chilean military world during the second half of the twentieth century,7 the cover also suggests that the reasons behind the road are geopolitical. Thus, the ideas surrounding the infrastructure today culminate a process of cultural redefinition that needs to be studied. Behind the implausible virginal image of a territory that was also backdrop to different struggles and conflicts, lies the richness of a story that tends to be forgotten. The Southern Road sought to complete an integration process that began in the early 20th century, when in 1902 an arbitration award traced, in a relatively definite way, the border separating the Chilean Patagonia from the Argentine one (areas that, with the exception of Chiloé island, maintained their indigenous status until the republican era). After the award, it was sought to ‘Chilenize’ the territory between Punta Arenas and Puerto Montt - colonization poles already consolidated - initiating a process that was not free of problems, conflicts and transboundary tensions originated essentially in the permeability that the international borderline presents in this section. However, the harsh geography made such integration difficult. The system of transversal hill strands running from east to west (Figure 4) hindered for a long time the possibility of executing communication routes that extended south those terrestrial roads like the Pan-American highway or the longitudinal railway. At the same time, as plains are located in areas far away from the coast, settlement processes arose in sectors like the border pampas. 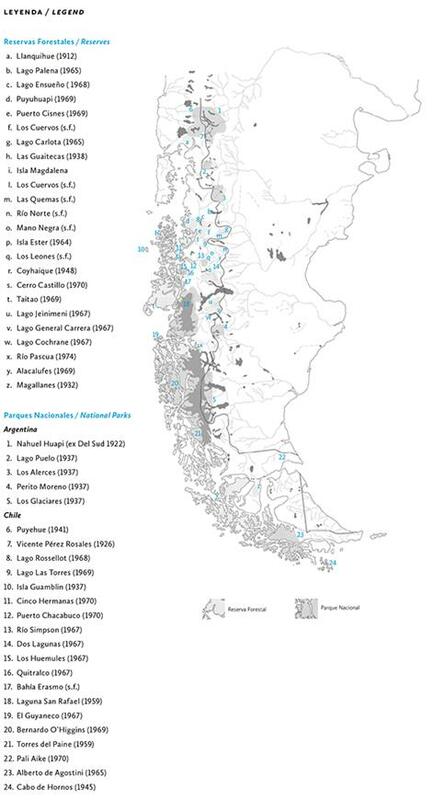 These territories were difficult to integrate within Chile but were very well connected with the Argentine Patagonia and its infrastructure networks. Argentine roads, Route 40 and ports such as Comodoro Rivadavia were essential infrastructures not only for trans-Andean development, but also for the survival of Chilean inhabitants themselves. Such bonds with a foreign region, together with the delay in establishing internal communication channels, outlined the dependency situation from which the greatest tensions derived when it came to its incorporation into Chilean life. 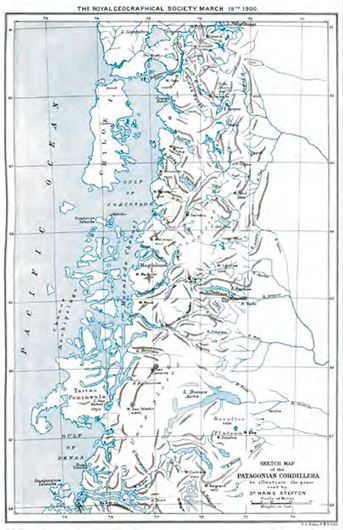 Figure 4 Topographical scheme map of Patagonia presented by Hans Steffen to illustrate a conference at the Royal Geographical Society in 1900. Nonetheless, such incorporation was not only related to the difficult task of building infrastructures in a rough geography, but also with the need to understand the role that this still unknown territory should play within the country. The incorporation was introduced as a cultural discourse linked to - and conditioned by - the problems of infrastructural integration. Prior to the Southern Road, the articulation between attribution of meaning and communication problems was perceived in the first nationalization attempts through roads, river and aerial works. One of the first attempts was the transversal road built during Carlos Ibáñez del Campo’s first government and celebrated by the photographs that Robert Gerstmann published in his book on Chile in 1932 (Gerstmann, 1932). They emphasized the advancement of sovereignty, celebrating the burning of forests necessary for the execution of the road works (Figure 5) together with the implicit risks in the presence of gauchos and Brits in Chilean land. Another example is the touristic project associated to cruise transport and the completion of a hotel at San Rafael lagoon at the end of the 30s. The first massive diffusion of the “paroxysm of ecstatic beauty” (Ried, 1939) of these landscapes in the En Viaje magazine showed the will to populate the coast, thus establishing a new geopolitical balance that affirmed sovereignty and assured the independence of the Chilean settlers along the inland sea, thanks to the nationalization of maritime transport and the construction of the Ofqui isthmus channel. Source: 280 grabados en cobre, 1932. Figure 5 Simpson River Valley. Forests burned to open Ibáñez Government’s international road. Photograph by Robert Gerstmann. Following the failure of these projects on the Ofqui isthmus by the end of the 30s,8 air infrastructure became fundamental. If in 1946 the first aerodrome began to operate in Balmaceda,9 by the beginning of the 70s nearly every populated area had its own (Millar, 1994:125). Thus, air transport became the main means of communication within the region, addressing the task of redirecting trade and people flows to Chile. This, however, also contributed to the abandonment of the will to colonize the maritime environment, taking its integration as unnecessary. At the same time, by connecting the border pampas by air, they could remain in their original state and their wild forests could be protected as natural reserves. Under these circumstances, there were no new colonization attempts until the second half of the 80s. In a wild state, ratified in 1959 with the demarcation of Torres del Paine and Laguna San Rafael National Parks, the space of archipelagos, fjords, channels, coast and continental ice became an extensive protected area. It was ascribed with the symbolic meaning of a landscape representing the nation and its continuity up to the South Pole. In this process, the plane not only freed the maritime environment from the urgency of its occupation, but also resignified the sea through new representations, such as the photographs that Gerstmann published for the new edition of his Chilean snapshots book in 1959. The aerial photos of glaciers and ice fields, taken during the first experimental flights in the 1930s, completed a series in which Aysén was valued as an indomitable space. These photos, through which this landscape was disseminated in a comprehensive manner perhaps for the very first time, anticipated the subsequent policies of natural resources protection. They represented, at the same time, an act of appropriation that was not entirely innocent: during the years of Chilean sovereignty claims over the Antarctic - based on natural continuity of glacial systems which, supposedly, could only belong to the country - the beauty of millenary ice would also help to argue in favor of a geopolitical domain. Between the 40s and the end of the 70s, the development of air transport contributed in establishing the idea of ​border pampas as sub-regions meant for cattle and maritime ones as spaces to be conserved or preserved. But air transport also contributed to the execution of the land route network beginning in 1976, during Pinochet’s dictatorship. In addition to enabling the transport of materials and supplies to the different camps installed in the jungles during its execution, flying over the territory allowed for the recognition of hilly, disconnected and wooded areas that were otherwise difficult to reach. Thus, in 1971 the first aerial photogrammetric survey was carried out, thanks to which it was possible to draw the first tracings. Although since the 30s different ideas were raised regarding possible land connection systems, the route was always imagined as a north-south main line and several secondary roads that, along the transverse valleys, would link the coast with the main road and the bordering pampas. To simplify the task, the north-south main road had to be zigzagged, integrating part of these transversal roads and crossing the mountain ranges through the lower areas.10 The first stage was executed between 1976 and 1982 (Figure 6), that is, when Argentina was also under a dictatorship, initiating war policies and territorial claims against Chile and England for the borders of Patagonia and the possession of the Falkland Islands. 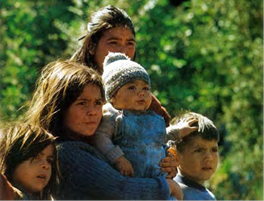 The prospect of a conflict, the fear of invasion (Polloni, 1982) and the greater isolation experienced by border residents persuaded the Military Administration of the urgency of the route. The work was started based on one of the routes proposed by Frei and Allende’s governments, facing a series of technical difficulties reported by the Revista de Caminos: cutting rocks, steep slopes and structures built on muddy soils or water (Figure 7). Figure 6 Southern road network. Schematic layout. In blue, continuity achieved circa 1982; in black, pre-existing fragments; in gray, future fragments; in dotted line, the transshipment between Route 5 through Chiloé and the continental route. Source: Revista de Caminos, 1982. Figure 7 Sample of the difficulties encountered in the road’s layout and execution. The route was conceived as a progressive system: first, narrower gravel roads were built, to be widened and paved in a second phase. The layout had to be curvilinear, in order to reduce infrastructural costs of straight stretches on such a rugged topography. Likewise, the size of bridges was minimized by organizing transshipments in private companies’ barges or rafts. Articulating the tasks of the mop (Ministry of Public Works) with those of the Military Corps of Labor, the Air Force, private companies and even volunteer civilians, in a few years the northern riparian stretch was executed. The rest was left for later. Together with these developments, territorial policies were introduced to activate the potentials of the sea. While the cruises to San Rafael lagoon were still active, the Military Administration sought to implement the fishery production of southern hake (CORFO, 1983; Brinck Pisent, 2011) and salmon (Shigeru, 1986). They developed plans, like the strategy for development of the green desert (Andrade, 1975), studies for coast settlements, and colonization strategies, beginning in 1983 with the reversal of Puyuhuapi Natural Reserve and the founding of the Melimoyu colony. The road would add a terrestrial alternative to activate this maritime area: as suggested by the military engineer Polloni, close to Pinochet and in charge of the aforementioned colony, it was necessary to “partially populate the tough Pacific coast (...) parallel to the construction of the transversal roads” of the Southern Roads Network (Polloni, 1986:133). The execution of the Southern Road and its transversal routes was clearly catalyzed by border tensions. However, a series of publications related to the military world back then show that the importance it acquired for the Military Administration was related to larger geopolitical ambitions: the Antarctic pretensions that had begun during the 40s. Since then, agents like José Domingo Cañas imagined the country as a global power for the ‘Pacific era,’ given its position within the southern hemisphere and its long coastline up to the Antarctic Peninsula, claimed by Chile since Pedro Aguirre Cerda’s government. This helps to explain why, in spite of being a terrestrial route, the road network was understood as a tool to activate and consolidate the settlement of a yet uninhabited maritime environment, but with an enormous potential to strengthen the country’s destiny. Despite the difficulties, the road network became the main vehicle of a greater utopian ideal: to return to the sea the leading role it had lost - especially during Frei Montalva’s government. It sought to demonstrate that the coast, the archipelagos and the fjords were not unproductive spaces per se, but could be inhabited if there was a will to create the conditions for this to happen. The greatest cultural impact of the Southern Road was recorded thanks to photography and the massive dissemination of the landscape traversed by the road. Since 1982, the opening of its first section was celebrated by different publications (Munro, 1982, Munro, 1989, SERNATUR, 1987), including the pictures by George Munro, Pinochet's nephew. Together with praising the General through his most important work, these publications celebrated sovereignty assertion, the transformation of a wild territory, its infrastructuralization and the rapprochement of settlers who, until then, had been isolated from national life (Figure 8). Figure 8 Aysén settlers photographed by George Munro. But also, however timidly, these publications started to question how far development should go. 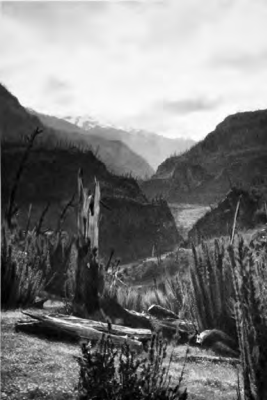 The hillsides of burned forests (Figure 9), immortalized by Munro in Los Ecos del Silencio: Carretera Austral (The Echoes of Silence: Southern Road), belonged to a series of landscapes that did not celebrate the nation’s advance over wild forests, but denounced the damage suffered by the ecosystem after devastating colonization. That is, if international tensions catalyzed an integrating project that would result in the Southern Road, this, in turn, triggered a new image of the Patagonian landscape that was beginning to question the developmental ideology through which it had been imagined for years. Figure 9 Hillside burnt logs photographed by George Munro. Beyond simple propaganda, the landscape assessment made possible through this project presented the region as either a platform for productive activation of a border open to the nation, or as part of a superlative aesthetic experience that would eventually require the preservation of its unique and beautiful untouched nature. In other words, the road had triggered the question on the role of Patagonia within the country, presenting ‘the Southern region’ under the same dichotomy present in the Chilean Pavilion at the Ibero-American Exhibition of 1992: a corporate country, rich in natural resources to exploit and, at the same time, a remote spot with sublime, pristine landscapes. 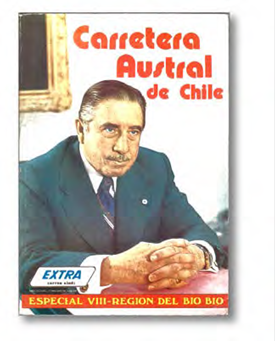 The latter, crystallized in the snapshot of Cerro Castillo, seems to have prevailed over the productive vision implicit in Pinochet’s portrait on the cover of the Association for Latin American Integration’s magazine. After the return to democracy and with the alignment of center-left governments with environmental causes and their rewilding discourse, the project of southern integration changed. Aysén was thus resignified as permanent frontier and metonym for a renewed idea of the country. In incorporating Aysén into national life, communication infrastructures played a key role in assigning a new meaning to the region. The abandonment of Hidroaysén and its energy road, the sanction of the network of Patagonian parks and the understanding of longitudinal continuity as a scenic route, seem to have established an imaginary prone to the preservation of the region’s relatively wild areas. As we have seen, the story behind such articulation is long and has undergone many stages, among which associating the Southern Road with scenic appreciation - which ended up defining it as the driving force of environmental defense - is perhaps the most striking one. In fact, the cultural process triggered by this infrastructure is radical, not only because the shift in meanings that it helped to ratify was defining within the region’s history, but also because it was able to resignify the work itself, affirming it as a visual device and not as a productive multiplier. Before this resignification, infrastructures such as the Ofqui channel, regional aerodromes or the Southern Road itself were conceived as interventions of greater strategic importance, despite their extremely small size: they were minimal interventions in relation to the amplitude of the territory that they should have contributed to incorporate and the dynamics that they should have triggered. The willingness to implement them entailed visions of the future that, fueled especially by the need to affirm national sovereignty, sought to detonate potential livestock, aquaculture, forestry or tourism activities in order to increase settlements in a still uninhabited, fragile border. Understanding tourism as a more respectful activity towards nature, the longitudinal integration recently imagined by environmental visions also attempts to detonate a productive potential: to position the Chilean Patagonia as a world class destination. However, this is achieved by reversing the terms of the equation. It’s not about increasing or helping the small local population, but, on the contrary, it’s about reducing its presence, building wilderness and erasing the traces of a past as livestock areas. In a context where geopolitical issues were replaced by geo-economic ones and a position within global tourism, the region’s resignification - from last border to permanent border - erased the traces of the history after which it was conceived. But imagining the Southern Road as a scenic route implies attributing to it the same meaning that the strategies of rewilding. It supposes, in the end, to value it solely for the aesthetic enjoyment that it offers. This leaves aside its material qualities, the difficulties behind its execution, the military and geo-strategic context that motivated its emergence and, above all, it forgets a history of difficult and conflictive incorporation. Architect Rome 3 (r) University of Chile 2001/2006. Postgraduate in Landscape Architecture, Pontificia Universidad Católica de Chile, 2004. Doctor in Architecture and Urban Studies, Pontificia Universidad Católica de Chile, 2018. He works in architecture, public spaces and landscape projects and is a professor in different Santiago universities. Has published articles in different national and international journals, and in 2009 his first book Arquitectura del Paisaje en Chile.